Statistics from the Pew Research Center compiled from a December 2013 poll show that 14% of all Americans (45 million) have at least one tattoo; 36% of adults age 18-25 have at least one tattoo; and 40% of adults 26-40 have at least one. Tats aren’t just for rebels or seamen any more. No longer is sporting a colorful tattoo a sign that one is a risk taker. And yet, there are definitely risks involved in getting inked. We’re not talking about the risk that you might someday regret having that romance indelibly memorialized on your bicep – we’re talking about the risk of serious infection, bloodborne diseases and allergic reactions. According to the Food and Drug Administration (FDA), contaminated inks have caused serious infections in a number of states. Of particular concern is a bacterial organism called non-tuberculous Mycobacteria (NTM), which can cause infections of skin, joints, lungs, and other organs, as well as eye problems. These infections can be difficult to diagnose and can require treatment lasting six months or longer with a combination of antibiotics. Severe abscesses can require extensive and multiple surgical debridements. In June of this year, two San Diego residents were diagnosed with NTM infections caused by contaminated tattoo inks; both required medical treatment. Previous clusters of outbreaks have been reported in New York, Iowa, Washington and Colorado. The 14 infections in New York were caused by a prediluted gray ink that was contaminated by the use of non-sterile water by the manufacturer. After the FDA’s investigation of the illnesses in New York and the other states, two ink manufacturers voluntarily recalled inks implicated in the outbreaks. 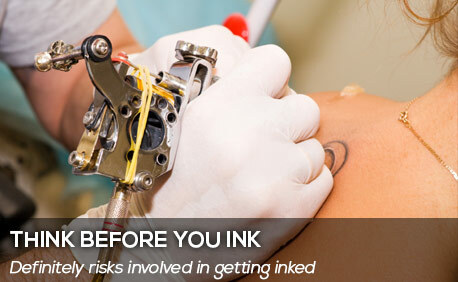 Ink can also be contaminated when the tattoo artist does not use adequate precautions during the tattooing process. Tap, bottled, filtered and distilled water are not sufficiently sterile to dilute ink, wash the skin or rinse the needle between colors. In addition, the use of tattoo inks past their expiration date subjects customers to the risk of infection. If the equipment used to create the tattoo is contaminated with infected blood, it can spread various bloodborne diseases — including hepatitis B and C (which may lead to life-long liver damage and subsequent liver cancer), HIV, tetanus and tuberculosis. Obviously, the consequences of these diseases are seriously and deadly. Almost all states regulate tattoo parlors. To become licensed under South Carolina law, a tattoo artist must be 21 and “must possess a certificate of successful completion, on an annual basis, of a course in bloodborne pathology and tattoo infection control as approved by the (Department of Health and Environmental Control), a current American Red Cross First Aid Certification and Adult Cardiopulmonary Resuscitation (CPR) Certification obtained either from the American Red Cross or the American Heart Association.” The state also regulates the location of tattoo parlors and the age limits of customers. People who do tattoos without being properly trained and licensed are known as “scratchers.” An unlicensed 20-year-old scratcher was arrested in Columbia on July 8 after two juveniles became ill from ink work done in the man’s apartment. Bryce Napoleon Fashaw was charged with two counts of unlawful tattooing. He faces a $2,500 fine and/or one year in prison for each count. Details of the victims’ illnesses are not known. Bad Tattoo? What to Do. If you or someone in your family is proudly sporting some new body art, you should be closely monitoring the inked area for signs of infection: redness, heat, swelling or pus around the tattoo. NTM infections are easy to misdiagnose, with symptoms that appear much like an allergic reaction (red papules, or solid, raised spots on the skin that often appear soon after a new tattoo), so don’t take chances – see a physician. There are many potential causes of tattoo-related health problems, and a number of possible sources of compensation to help pay for the medical expenses and pain and suffering endured by the victim. At The Louthian Law Firm, we can help you hold the responsible parties – the ink and equipment manufacturers, the careless practitioners, the disreputable business owners – accountable for your loss. Call (803) 454-1200.